BACOLOD, Philippines - “Times are changing and this new and future technology is leading the way,” Mayor Monico Puentevella said as he welcomed the guests of the 10th Knowledge Exchange Conference (KEC) for Community eCenters yesterday. 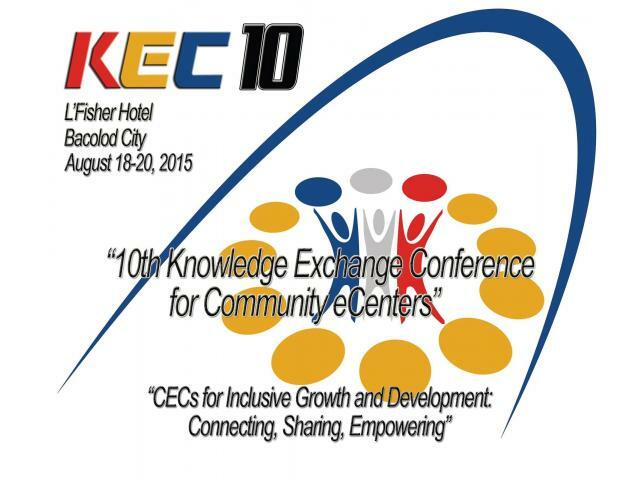 With over 300 delegates all over the Philippines, KEC10 aims to exchange ideas and knowledge among eCenter managers, Local Chief Executives, telecenter stakeholders and ICT4D enthusiasts. It is held annually by the Philippine Community eCenter Network (PhilCecNet) in coordination with the ICT Office (DOST). During the conference, speakers will talk about Social Entrepreneurship, Rural Impact Sourcing and the CeCs, TESDA Online Program and how your CeC can participate with the program, eHealth and many more. There will be sharing of good practices in eCenter operations with other ICT4D advocates and members of PhilCecNet. In the welcome remarks, the mayor further expressed that “life would be difficult” without modern technology, saying that everything from mobile devices to social media are constantly being used by the majority to expand their reach to the world. Business Process Outsourcing (BPO) companies are also instrumental in offering employment to the community and that others have already established a career in the industry, he added. “They are vital for the economic growth of city and one of the reasons why Bacolod is now booming,” said Puentevella. The exchange is necessary not just for the city but for the nation as a whole. In one of the sessions, Rep. Ashley Acedillo, one of the proponents for the creation of a DICT bill also mentioned, "The DICT is not going to be bureaucratic but visionary. The only way for it to be visionary is to entrench a mechanism of private and public sector cooperation - the initiative on the DICT must be from the ground up." 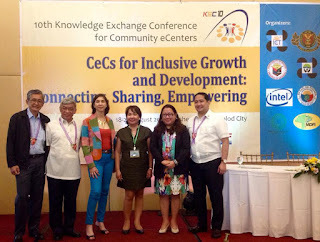 The KEC is an annual event organized by the Philippine Community eCenter Network (PhilCecNet) in coordination with the ICT Office of the Department of Science and Technology (DOST). This year’s theme, “CeCs for Inclusive Growth and Development: Connecting, Sharing, Empowering” will center on the CeCs changing role of connecting the community amidst free Internet access and their strategic and critical position to the hub for sharing relevant content and resources as well as empowering mechanisms through education and gainful economic engagements.